With the busy holiday season upon us, I thought it would be a great time to come up with a new slow cooker dinner recipe. Oh boy, how I love it when dinner is magically ready at the end of a busy day, thanks to a little prep work that I did earlier in the morning! So, inspired by some recipes I saw when browsing online, I decided to turn my Slow Cooker Marinara Sauce from my Fast & Fabulous Cookbook into a (meat-based) ragu Sauce. I first have to tell you that my 8th grader is not a huge meat person—she could easily survive as a vegetarian. She is not a big fan of dishes like my Slow Cooker Steak Chili, which I love, yet she’d choose Veggie Chili over that any day. And she’s also not too thrilled when I make chicken too many nights in a row. It’s always fun as a parent keeping up with all these different, ever-changing preferences (can you relate? )—not that I always accommodate! 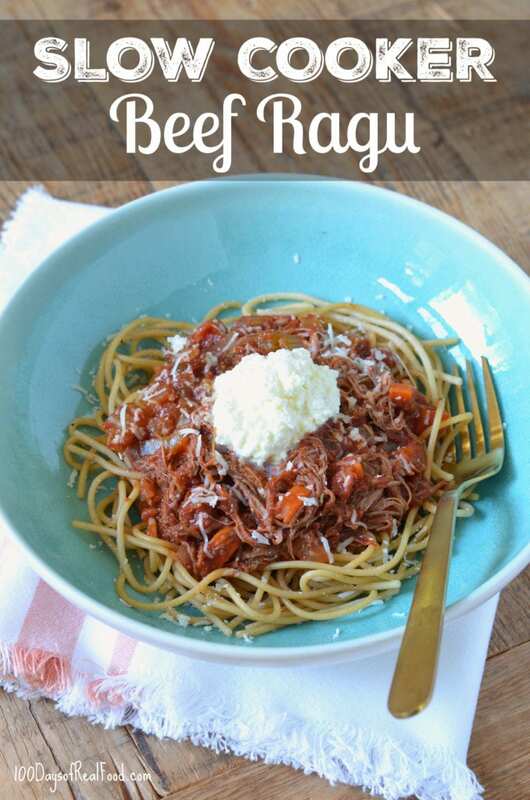 So, I honestly held my breath when she walked over to the slow cooker to see what was for dinner while I was making this new ragu recipe. I was waiting for a complaint and shocked when she instead said, “Oh, this looks good!” I actually thought she must be talking about something else next to the slow cooker (Um, the cooked noodles look good? The parmesan cheese looks good? Surely it wasn’t our meaty dinner! LOL). But low and behold, she loved seeing the mix of carrots and celery in the meat sauce, and she said she really liked it when we put a little dollop of ricotta on top of the finished dish. So, I now have a new crowd-pleasing, meaty dinner to add to my slow cooker arsenal. I’ll for sure be making this one again and again! Layer all the ingredients in the slow cooker, starting with the onion and ending with the canned tomatoes. Turn on high for 5 or 6 hours, or low for 8 to 10 hours. You can take the lid off for a bit at the end to help reduce the sauce down to make it thicker (or spoon some liquid off the top). 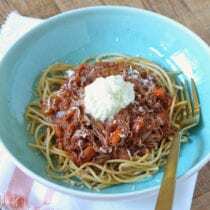 Divide the sauce evenly over beds of cooked whole-wheat noodles, top with parmesan and ricotta cheeses (if desired), and serve. There is no need to cut the meat before adding to the slow cooker as it will be nice and tender when done (it easily pulls apart with a fork on the plate). However, you could cut the meat across the grain into a few pieces prior to placing in the slow cooker if you want smaller pieces. Your daughter sounds like such a healthy eater! How did you do that? :) I’ll definitely be trying this recipe, I love that it has very few ingredients! Do you cut the meat before cooking or is it easy to shred at the end? It looks so delicious! I think it might be friday’s dinner. So you put the slab of meat in there as is or cut it up? The finished product appears its shredded? Hi Lisa, every time I use flank steak I always find it so tough to chew. What are your tips? What’s the white fluffy cream that you added on top of it? Can you provide it’s recipe also? Ariana – She topped it with ricotta cheese! I really want to try this at home. Questions is the pasta not considered processed? Is there any other cut of beef that will work besides flank steak? I have quite a store of beef in my freezer that I’d like to use up before I purchase any more. I think stewed beef would be the next best choice.